You’ve done your research on orthodontic treatments and finally settled on Invisalign®. Congratulations! You’re one step closer to that smile you’ve been dreaming of. But before you step into your orthodontist’s office, it is important to know what you’re getting yourself into. If you’re curious about what happens during and after treatment, and what your responsibilities will be, continue reading. Are you ready to make an appointment with an experienced, local Invisalign® provider? Request an appointment at Heroes Dental in the Rio Grande Valley. With locations in Laredo, Mission, and San Juan, and services that cater to pediatric and adult patients, we are able to meet your dental and orthodontic needs close to home. As with any orthodontic treatment, individuals should have a good understanding of their responsibilities to get through treatment without too many setbacks. The following are topics of discussion that Invisalign® patients should become familiar with as their treatment progresses. Length of treatment. Treatment with aligners is most effective when they are worn 20 to 22 hours every day. You’ll only need to remove them during eating, brushing, and flossing. While each case is different, the average treatment time is 12 months for adults. This timeframe may vary for teens. Your orthodontist will discuss your treatment plan in detail prior to initiating treatment, so make sure to have a list of questions ready to go. Checkups. While your aligners will be changed every two weeks, checkups with your orthodontist will be scheduled in four to six week intervals. Your doctor will simply want to make sure that the treatment is moving along as planned. Invisalign® and food. One of the most attractive features of Invisalign® is the ability for individuals to continue eating all the foods they love. There are no dietary restrictions with your aligners unless your orthodontist says otherwise. You are required to remove your aligners while you eat. Make sure to brush and floss after every meal for proper hygiene. Smoking is discouraged during treatment as this may discolor or stain your aligners. Chewing gum while wearing aligners is also discouraged. Take precaution with sugary drinks such as fruit juices, and some alcoholic beverages, as sugar particles may get trapped between your aligners and your teeth. Cleaning aligners. Your aligners can be cleaned using the Invisalign® Cleaning System, which your orthodontist may recommend. They can also be cleaned by brushing them with a regular toothbrush and then rinsing them in lukewarm water. Avoid running your aligners under hot water, as this may warp the plastic, and hinder your treatment plan. If your aligners fall into an unsanitary place, sterilization is important. The Cleaning System is recommended for such situations. Discuss hygienic options and cleaning tips with your orthodontist for more information. Cracked aligners. If you notice a crack or malformation in your aligners, contact your Invisalign® provider immediately. A replacement will be needed, as a damaged aligners will not provide sufficient pressure to adjust the position of your teeth. Do not delay. Your teeth may shift to their previous position if there is not the right amount of pressure present. You’ll definitely feel like a whole new person after you’ve completed your Invisalign® treatment. Though you’ll be on your way – confident smile and all – there are a few things to consider in order to maintain those pearly whites. 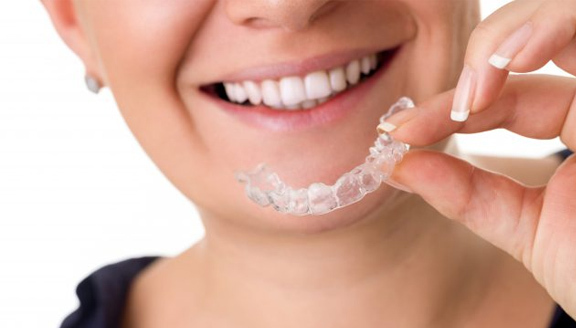 Whether you’ve completed orthodontic treatment with braces or clear aligners, your teeth may gradually shift back to their initial position over time without preventative measures. Most orthodontists recommend the use of a retainer to secure the position of your straightened teeth after treatment. There are two types of retainers that your orthodontist may recommend. Keep in mind that every case is different. An orthodontist will determine whether a permanent or removable retainer is best for your teeth. Removable retainers are custom made from an impression or scan of your teeth. They are clear trays much like the Invisalign® aligners and worn while you sleep. A permanent retainer is essentially a wire that is bonded to the inside surface of the bottom front teeth. Continue with your dental hygiene routine after treatment with Invisalign® to ensure a healthy smile that will last a lifetime. Don’t shy away from your orthodontist! While you won’t have to make as many visits to a dental office after your treatment is complete, regular checkups are important in maintaining your newly aligned chompers.